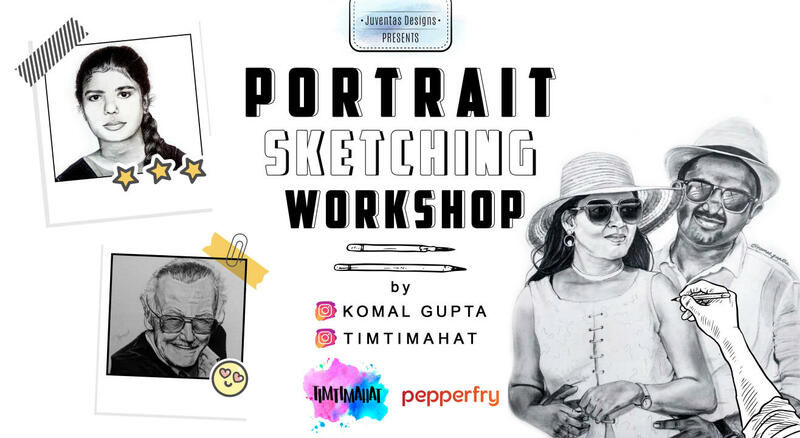 PORTRAIT SKETCHING WORKSHOP BY KOMAL & DIVYA. We always want to create portrait sketches of ourselves, friends & family. But we don't know where to start? We always get stuck while drawing eyes/nose/ lips, etc. If not this, we don't know how to draw well proportioned portrait. This workshop is designed to emphasise the basic elements of creating figurative drawings & portrait. You'll start with the basic understanding of tools & techniques, making elements, composition & detailing of the same. You'll walk out of the workshop with a beautiful portrait creation on your own. No prior experience in any art form required. Warm up session for free hand movement focusing on shapes & muscle exercise. Get basic theory knowledge of using tools for drawing shapes, strokes, shading, controlling tones, composition & methods. Learn various elements of portrait starting with step-by-step sketching of eyes, nose, lips, ears & hairs. Learn how to study a portrait & how to compose it. Learn various techniques, tips & tricks/ strategies to draw realistic sketches. FC Pencil : HB, 2B, 4B, 6B & 8B. It'll be a 4 -hour long session. We ensure individualised attention & instruction. Fee include all the materials & Refreshments.